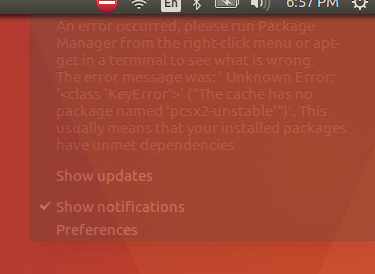 "An error occured, please run Package Manager from the right-click menu or apt-get in a terminal to see what is wrong. the error message was: ' Unknown Error: '<class 'KeyError'>' (The cache has no package named 'pcsx2-unstable'")'. This usually means that your installed packages have unmet dependencies." I have done apt-get update/upgrade several times since installation, and I can use PCSX2 no problem. Someone explain this to this poor windows guy? Did you use gregory's PPA to install PCSX2 or did you install it from Ubuntu's repositories? I think the packet is pcsx2-unstable:i386. There are command to check the cache consistency. I think it is apt-cache check but I'm not sure. @gregory I will check into that when I get back on ubuntu, doing some homework on windows atm, but I thought it would also be pertinent to mention that every time that message pops up I show and then run updates and pcsx2 builds the latest revision. I guess i was curious if that behavior was intended?